Synopsis (from the publisher): It's a day like any other for Tracy Waterhouse, running errands at the local shopping center, until she makes a purchase she hadn't bargained for. One moment of madness is all it takes for Tracy's humdrum world to be turned upside down, the tedium of everyday life replaced by fear and danger at every turn. Witnesses to Tracy's Faustian exchange are Tilly, an elderly actress teetering on the brink of her own disaster, and Jackson Brodie, who has returned to the land of his childhood, in search of someone else's roots. 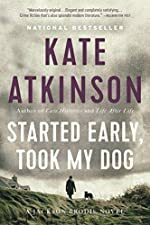 Variously accompanied, pursued, or haunted by neglected dogs, unwanted children, and keepers of dark secrets, soon all three will learn that the past is never history -- and that no good deed goes unpunished.